KANSAS CITY, MO--(Marketwired - Jan 4, 2016) - After more than 35 years at Burns & McDonnell, chairman and CEO Greg Graves announced to the firm's more than 5,300 employee-owners today that he will retire at the end of 2016. Graves, arguably one of the most transformational leaders in the firm's 118-year history, has served as CEO since 2004. He is the firm's sixth CEO, second in tenure only to a member of the co-founding McDonnell family who held the position more than four decades ago. "I'm a big believer in bringing in new perspectives to an organization, and I think it's time for someone else to have an opportunity to provide their vision for Burns & McDonnell," says Graves, who came to Burns & McDonnell as a mechanical engineer after graduating from the South Dakota School of Mines and Technology. "When I took the job of CEO, I made it my responsibility to use this role to make a real difference for our employee-owners and the city that's been home to our world headquarters for more than a century. I have to say, I'm really proud of what we've accomplished." The number of employee-owners has more than tripled from approximately 1,500 to more than 5,300 today. Burns & McDonnell's world headquarters is now the site of one of Kansas City's largest construction projects, with a major expansion expected to be completed in the spring. The firm has continued to diversify its business. It now offers more than 350 services in fields ranging from architecture to zoology; and is now ranked no. 17 on Engineering News-Record magazine's list of Top 500 Design Firms. Sales at the firm have ballooned by more than 570 percent from $387 million in 2003 to $2.6 billion in 2015. The number of regional offices within the United States grew by nearly 30 percent, combined with development globally that included the launch of an international division with offices in India and Canada. Eighteen years before Graves took on the role as CEO, he watched his firm go through a rebirth by becoming 100 percent employee-owned. The move sparked a culture of entrepreneurialism that Graves was ready to harness and take to the next level and make Burns & McDonnell the place to work. "The first year we submitted to FORTUNE's Best Companies to Work For List, we landed in the 50s," says Graves, who then studied the top 10 companies with a goal of rising to the top. "Each year we would introduce a variety of new services or benefits to our employees-owners. It could be something as simple as on-site dry cleaning or farmers markets to larger investments, like an in-house medical center. This year, we're introducing an on-site child care center and pharmacy." Graves' efforts earned Burns & McDonnell a continued rising seat on FORTUNE's 100 Best Companies to Work For List, now ranked at no. 15. In addition, the firm has won top workplace honors from more than 20 publications across the country, which includes being ranked the no. 1 Best Place to Work in Kansas City by the Kansas City Business Journal for four consecutive years. "When I interviewed for CEO, I said one of my stipulations was to increase the amount of money we gave through our foundation," says Graves, who has grown the Burns & McDonnell Foundation from $4.5 million to $30 million while CEO. In 2014, the foundation made its largest contribution of $2.5 million to the University of Kansas Hospital paired with a personal donation of $1 million from Greg and his wife, Deanna. "Kansas City has been good to Burns & McDonnell and my family, so I committed to doing all I can for this community," says Graves, who was recently named Kansas Citian of the Year by the Greater Kansas City Chamber of Commerce. In the past two years, Graves has spearheaded millions of dollars in donations from Burns & McDonnell employee-owners, with recipients ranging from United Way and Habitat for Humanity to Ronald McDonald House and Wounded Warriors. His most popular philanthropic venture may be the Burns & McDonnell Battle of the Brains competition to promote science, technology, engineering and math education. Within the past four years, the firm has distributed thousands of dollars in grant money to area schools and more than $2 million worth of exhibits to Science City. Five years after serving as chairman of the Greater Kansas City Chamber of Commerce, and the driving force behind the Big 5 initiatives, Graves says his retirement plans will maintain an emphasis on some of those key initiatives. Graves will focus on his chairmanship of both the University of Kansas Hospital Authority Board and the Kansas City Repertory Theatre. "You can't have a world-class city without excellent healthcare that you trust is the best for your family," says Graves. "A city the size of Kansas City should also provide a culture of performing arts that is competitive with the best in the country." A group of CEO candidates will interview with the firm's board of directors this week and the CEO-elect will be announced on January 11. "I am happy to share that all of the candidates are from inside Burns & McDonnell," says Graves. "I have complete confidence in each of them and look forward to hearing what are sure to be innovative ideas for the future of Burns & McDonnell." Burns & McDonnell is a company made up of more than 5,300 engineers, architects, construction professionals, scientists, consultants and entrepreneurs with offices across the country and throughout the world. We strive to create amazing success for our clients and amazing careers for our employee-owners. Burns & McDonnell is 100 percent employee-owned and is proud to be No. 15 on FORTUNE's 2015 List of 100 Best Companies to Work For. For more information, visit burnsmcd.com. 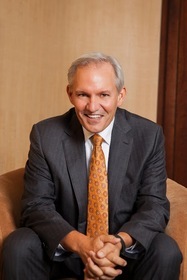 Burns & McDonnell chairman and CEO Greg Graves announced he will retire at the end of 2016.